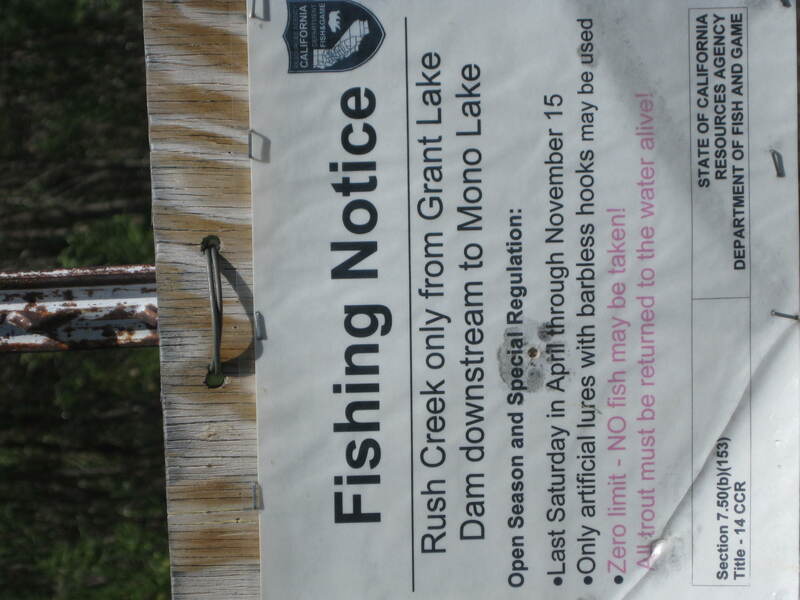 The catch-and-release section of Rush Creek remains a no-go in early summer, unless the water flows change. (Jim Burns). How’s the old Sam Cooke song go? Jumpin’, that is, everywhere except the eastern Sierra. Who’s to blame for this atrocity? Every summer, Bishop, Mammoth Lakes and environs are overrun with bait and fly fishermen, who want to catch as many naturals and plants as possible, from opening day in late April, until season’s end, Nov. 15. You’ll see them wade, float and paddle in the area’s lakes, rivers, streams and private waters. You’ll see them buying up as many worms, dry flies, nymphs and streamers as the sports and fly shops can carry. New expensive rods sell; flashy reels fly off the shelves; tippet and leaders; hemostats and non-felt-bottom boots. Bammo! It’s usually an injection of debit cards and cash for the summer economy. So this year who’s to blame for fishing that can only be described by this writer as mediocre? That’s after three days on water from the C/R area of Rush Creek, to Hot Creek, to the C/R lower Owens. Well, here’s the sad truch: It’s not actually who’s to blame, but what. And that what is Mother Nature. I mean when’s the last time a guide actually refunded your trip deposit, rather than take you out? It just happened to me. My son and I watched the white caps on Hot Creek as the water tore through that wind-beaten canyon. You read that correctly — white caps. So, if you’re headed up for your annual Sierra fix, better check the cfs numbers carefully. The same guide told me he didn’t expect normal flows until August. According to him, last year, which also had unusually heavy snowfall, July was the magical month. Aside from private waters not affected by the torrent of water coming off the mountains, if you must fish (and if you’re like me, you must), try The Gorge, north of Bishop, off Highway 395. Any fly shop can give you exact directions. Even with the moderate water flows, fishing The Gorge is tough. 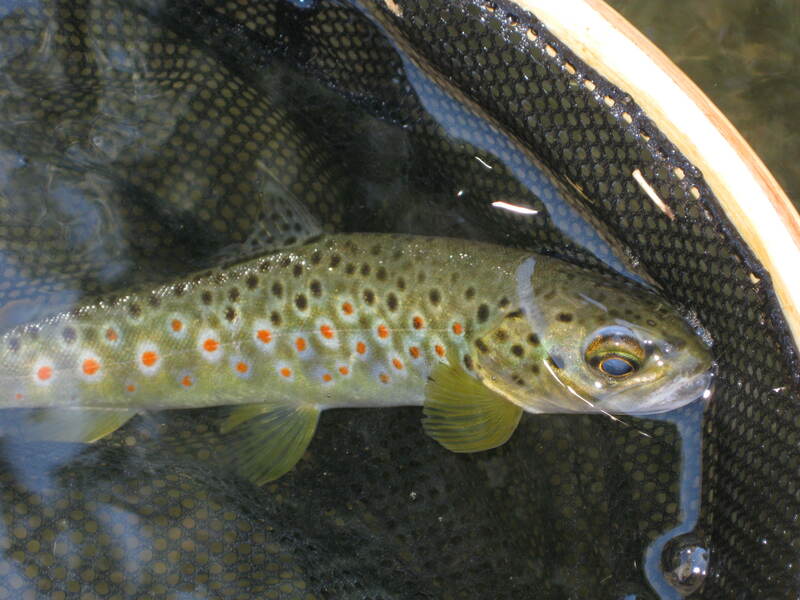 We managed to catch several browns in several hours; the lengths were more Southern California average than the monsters you’ll find on any local fly fishing Web site. Much as I hate to write this, I probably wouldn’t do it again this season. Which is great news for thirsty Los Angeles after a string of drought years.